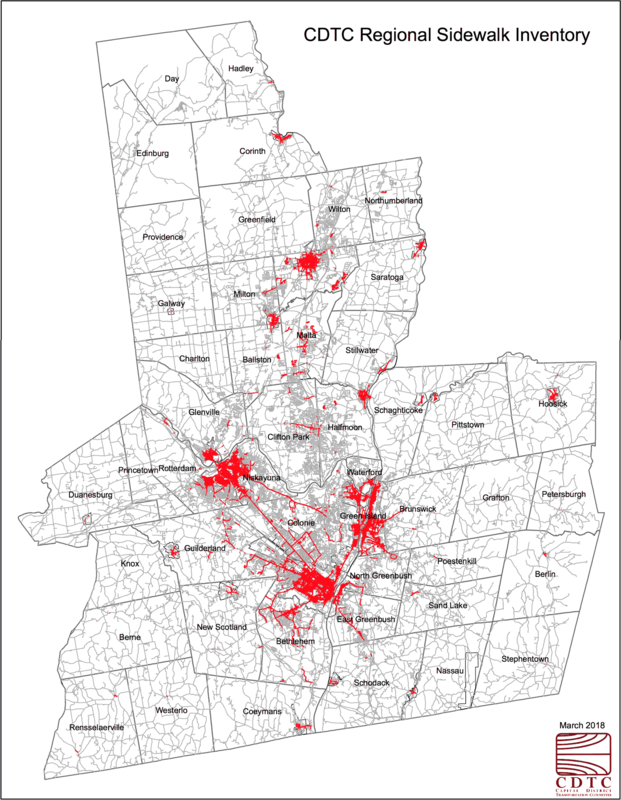 This map is from the Capital District Transportation Committee's regional sidewalk inventory. We enjoy both maps and sidewalks. So, not surprisingly, we were interested in this new map of all the sidewalks in the Capital Region. That's some 1,225 miles of sidewalk. The map is the the product of three years of work by the Capital Region Transportation Committee. It was created primarily for compliance work for the Americans with Disabilities Act, and also to assist with planning for pedestrian infrastructure. Also: It's a map of all the sidewalks. It's in large format at the top -- click or scroll all the way up. CDTC has posted a report pdf with maps online if you're like to get a really close-up view. The report explains the methodology for constructing the sidewalk inventory. As you'd probably expect, the majority of the sidewalk mileage is in the Capital Region's cities, 69 percent. 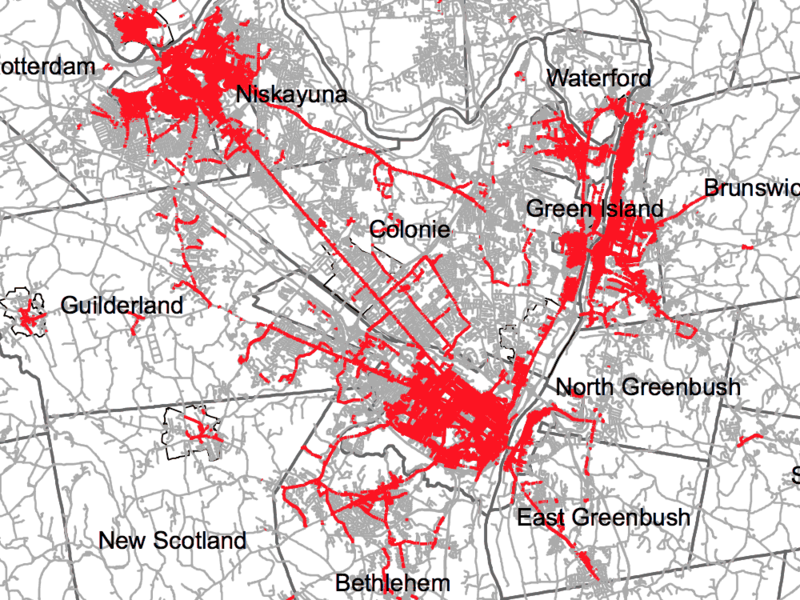 There are 14 towns and three villages with less than 1 mile of sidewalk. Nine of those towns -- mostly toward the edges of the Capital Region's four core counties -- have no sidewalk infrastructure. The city of Albany has the most sidewalk mileage of any municipality in the Capital Region -- 273 miles. That's not really surprising given the city's density compared to the region as a whole. But even in the city of Albany there are gaps in the sidewalk network. And one that jumps out right away is the triangle-shaped section on the city's southwest side that's bounded by Western Ave, Route 85 and the city line. That neighborhood is relatively dense, it's walking distance to destinations such as Western Ave retail, UAlbany, the Harriman State Office Campus, and Buckingham Pond. Yet it has almost no sidewalks. And people do walk there -- especially along Berkshire Boulevard, which is sort of like the spine of the neighborhood. So maybe a sidewalk project there is worth thinking about. This seems like a good place to again mention that one of the most important ways of keeping people safe when they're walking and biking is through the design of the streets they're using. Looking both ways, using crosswalks, walking on the correct side, signaling -- those are all good. But design and infrastructure matters a lot.